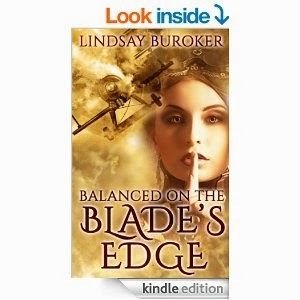 Balanced on the Blade's Edge (Dragon Blood Book 1) by Lindsay Buroker. It's been a while since my last post. Small part of that has been down to work but the rest is simply down to a lack of enthusiasm to read. Sometimes you go through periods where reading suddenly feels like a chore and when that happens to me I prefer to step back and take a break. Well, I'm glad to say that the itch is back and Balanced on the Blade's Edge was what brought it back. The story follows two main characters. You have Colonel Ridge Zirkander, a hotshot pilot, who having overstepped his mark one too many times is sent to command a prison in the middle of nowhere. It's here that he meets Sardelle Terushan, a sorceress who has just woken up from 300 years of slumber. The story then divulges into their interactions and Sardelle trying to somehow figure a way to free her soul-blade that's buried under a mountain. I initially thought the book was sci-fi but after the first few chapters I soon learnt it was a blend of sci-fi and fantasy. Normally, merging the two never works and can produce disastrous consequences but this book has actually succeeded where many have fallen. The book really is beautifully presented and I wasn't even sure if it was self-published. Such was the attractive cover and the crisp, engrossing writing that you'd be forgiven for thinking this was a published book. One of the main positives of this book was the characterisation. I really got a sense of Ridge and Sardelle personalities. Also the setting of the book captured my imagination. The book is set in a prison on a mountain side and in my mind I pictured snow dusted mountain peaks with a stone fortress set between them. I could easily close my eyes and picture myself there. One minor negative I found was that I felt the romance between the two characters was a bit rushed and as a result their relationship felt a bit hollow. If you're looking for a light read that merges both sci-fi and fantasy with a dash of romance then give this book a read.